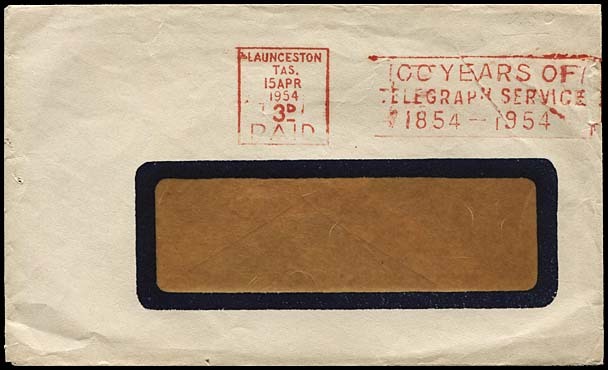 Slogan cancellations: 100 Years of Telegraph Service 1954 - 1954.
was introduced at all main Post Offices from 2 April 1954 - five days before the first day of issue of the commemorative Telegraph stamp on 7 April. 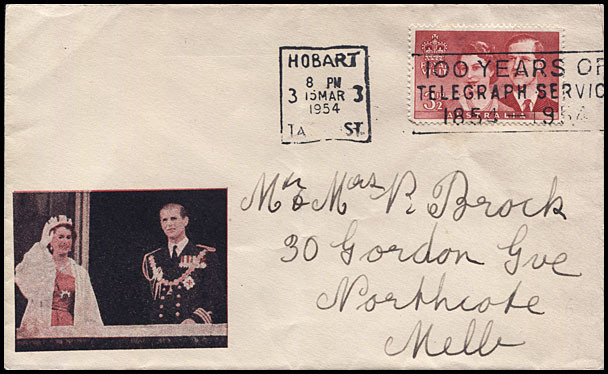 Hobart (Monday 15 March 1954). Brisbane (Sunday 4 April 1954). 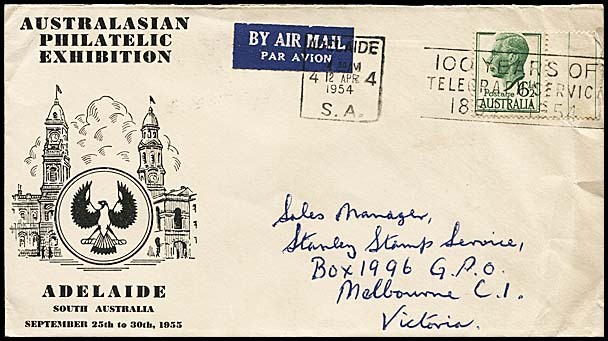 The latest date recorded of use is at Melbourne on 4 October 1954. Walden claims the slogan was withdrawn in October 1954. Lines 1 and 3: 4 mm high. Line 2: 3 mm high. The list below provides examples from the eight Offices which used the 100 Years ... slogan cancellation. A specialised analysis of the formats and the dies of each slogan by Office of use can be obtained by clicking on the relevant hyperlinks provided. Those Offices without hyperlinks have only the example provided. There appear to be five distinctive dies for the 100 YEARS slogan - in addition to the use of circles or boxes and the inscriptions at the base therein. These dies are identified by the relative position of letters in the slogan. 204 examples are recorded for this slogan in the Census. L (of TEL...) is above or just in front of the 1 (of 1954). 23 April 1954 with Adelaide Box 4.
at Adelaide: between 5 and 22 April 1954.
at Brisbane: between 17 and 27 May 1954. Perhaps it was a spacing which was created during maintenance work. 5 April 1954 with Adelaide circle with SA AUST at the base. A unique error - perhaps a typesetting error - is recorded for 14 examples from Adelaide where TELEGRAPH registers as TIELEGRAPH. 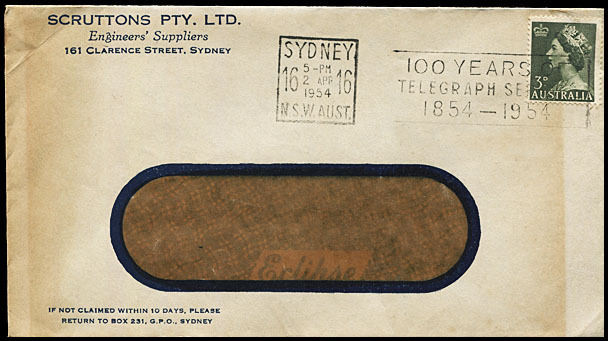 It is not a separate die but it appeared from 7 May 1954 to 23 September 1954 in Adelaide only. 7 May 1954 with Adelaide circle with SA AUST at the base. 1 (of 1854) is immediately below the upright of the L of TELEGRAPH. 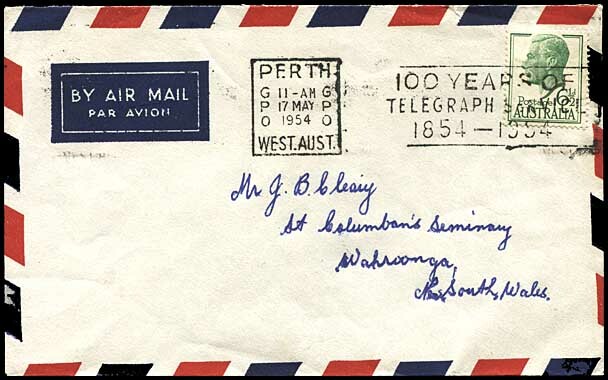 28 May 1954 with a Sydney 7 Box. Number in the Census: 27. Number in the Census: 21. 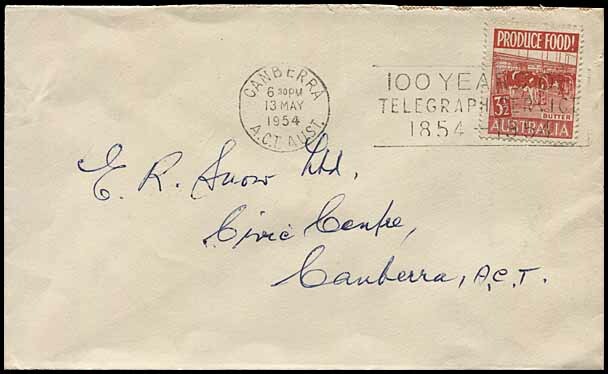 7 April 1954 (First Day of issue for the Telegraph stamp). Number in the Census: 1. 15 March 1954 - three weeks before the intended date. Number in the Census: 12. Number in the Census: 3. Number in the Census: 75. 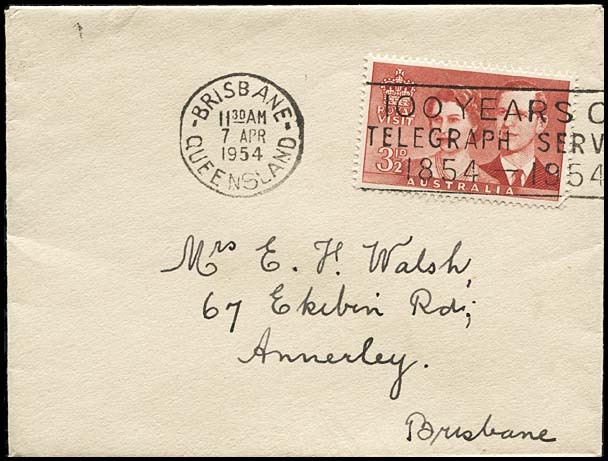 7 April 1954 - First Day of Issue for the Telegraph stamp. Number in the Census: 4. Number in the Census: 61. 2 April 1954 - First Day of Issue of the slogan.